Sending secret messages can be fun to do. 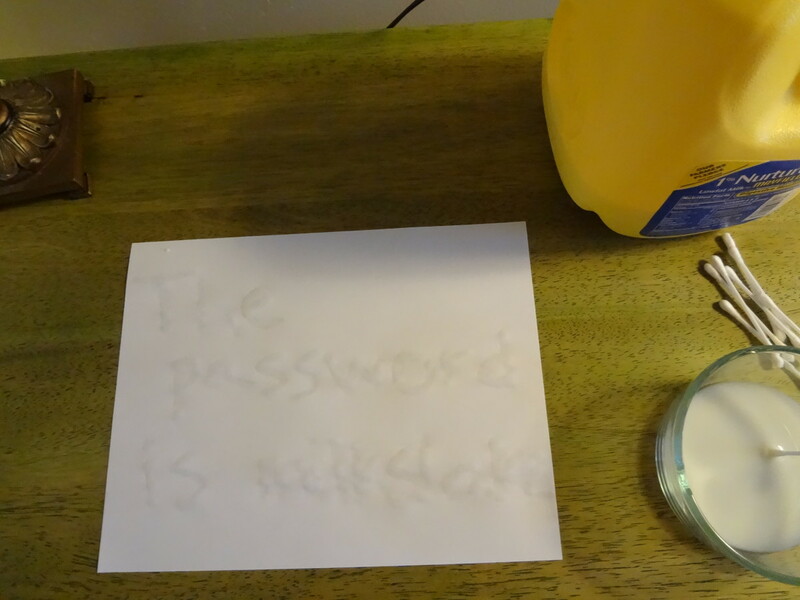 Using invisible ink is a cool way to hide your messages until its time for them to be read. 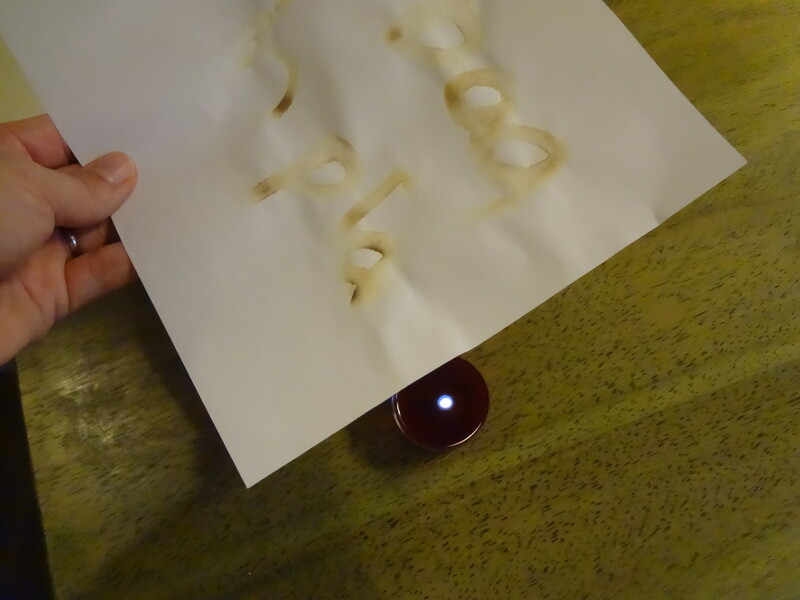 There are 9 sneaky ways to make invisible ink below. You can use lemon juice, milk, baking soda, cornstarch and iodine, and a white crayon. You will also discover how to send a message with a banana, how to make glow in the dark messages, and how to make disappearing ink. 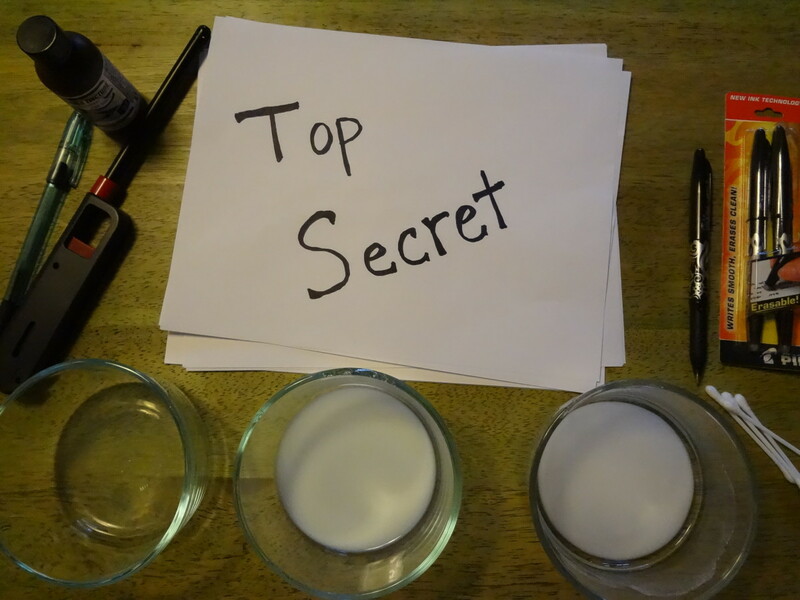 These invisible ink recipes are great for wannabe spies and secret agents, mystery parties, pirates and treasure maps, wizards, mad scientists, or just for anytime you want to pass on a secret message. 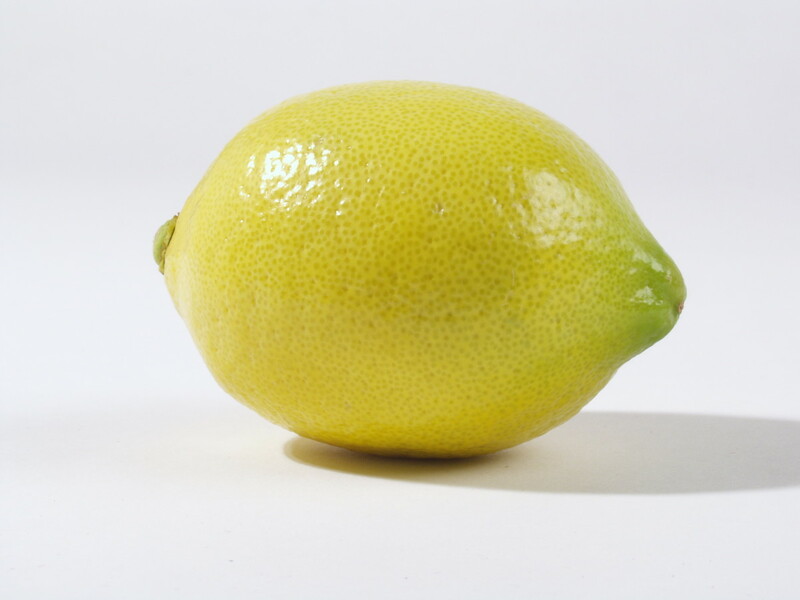 The lemon juice is visible when wet. When it dries, it won't be seen on the paper. The message turns brown when it is held over the candle. Decoding the message in the oven. Other juices will work as secret ink as well. Try grape juice, apple juice, orange juice, onion juice, and even vinegar. The most common way to write a secret message is with lemon juice. When it dries on the paper, it will be nearly invisible. It's a great way to send messages that can't be read by everyone. Begin by pouring a bit of the lemon juice into a bowl. If you are squeezing the juice from a lemon, you may have to add a little water. 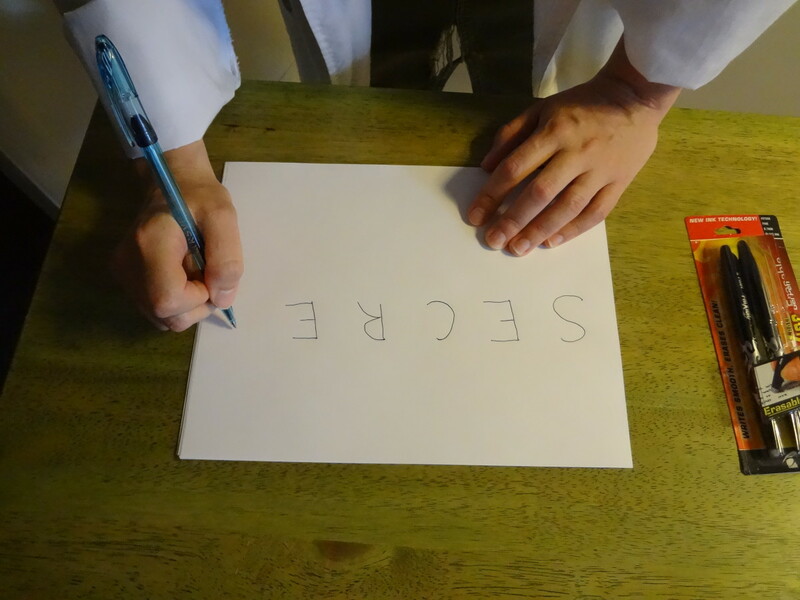 Use a q-tip, toothpick, or a paintbrush to write your message on the paper. Don't get the lemon juice too thick or it will cause the paper to rumple where the juice is. But make sure you get enough juice on it that the message will be visible later. Let the paper dry thoroughly. This will take about an hour. To decode the message, you will need to heat up the paper. The best way to do this is with a candle. Hold the paper over the candle until the words become visible. Don't let the paper actually come into contact with the flame or get too close to it. It will catch the paper on fire or scorch it. It will take awhile to fully decode the message. The words will become a brown color as they are heated up. You can even put the paper into the oven on about 350o for about five minutes. Make sure to keep an eye on it so that it doesn't burn the paper. The oven method may be the best route if you are doing this with young children. You can also use an iron or a lamp that is turned on, or even the sun to make the ink visible. Some of the methods will take a long time. Be careful not to get burned. It works because the lemon juice oxidizes in the air. Heating it causes that process to speed up. The juice will turn brown on its own in time. Use milk as an invisible ink. When it dries, the message can't be seen. 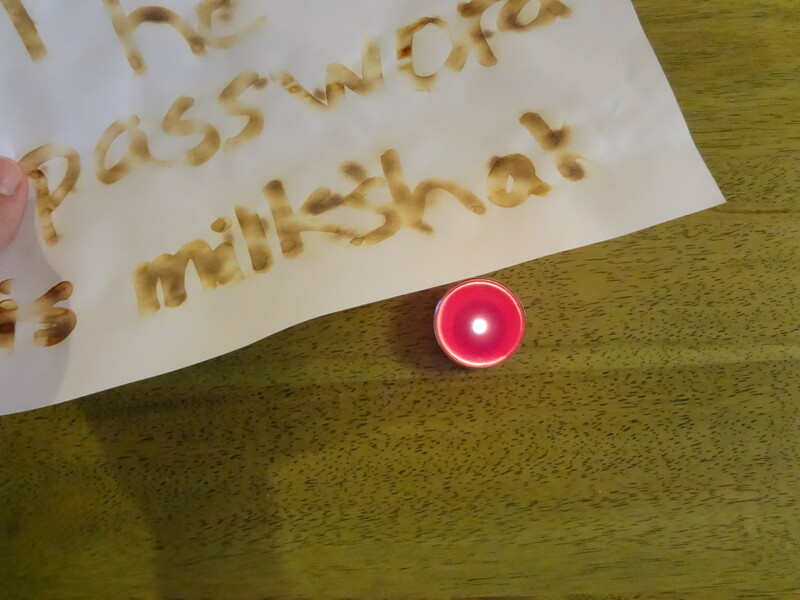 Hold it over a candle, and the secret message appears. Milk is another thing that can be used as invisible ink. Most people keep milk in the house, so it can be easier to use than lemon juice. (It works the same way as lemon juice invisible ink if you need to peek at the more detailed instructions above). 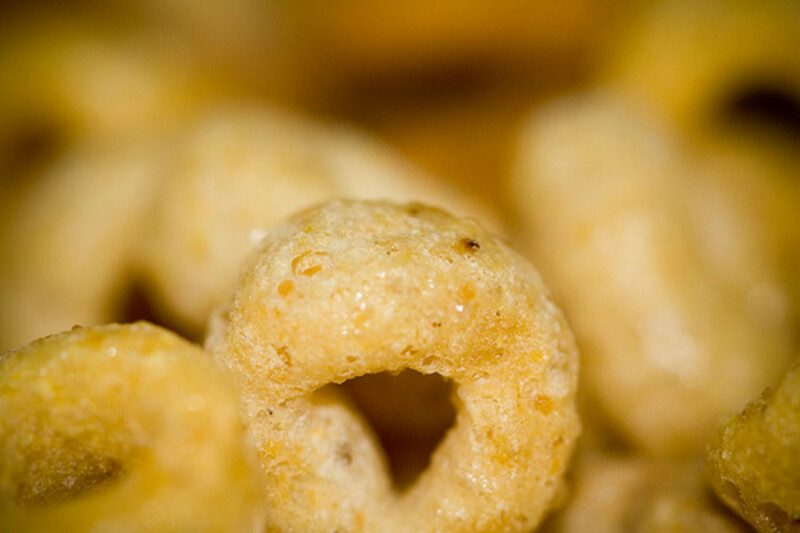 Pour some milk into a bowl. You won't need much. Dip the q-tip or whatever you are using to write the message into the milk. Carefully write your message trying not to get the paper too wet. Allow the milk to dry. When you are ready to read the message, just hold the paper over a candle or put it in the oven. The message will turn brown as the candle heats it up. Try to keep the paper from getting too close to the flame to avoid scorching and catching the paper on fire. 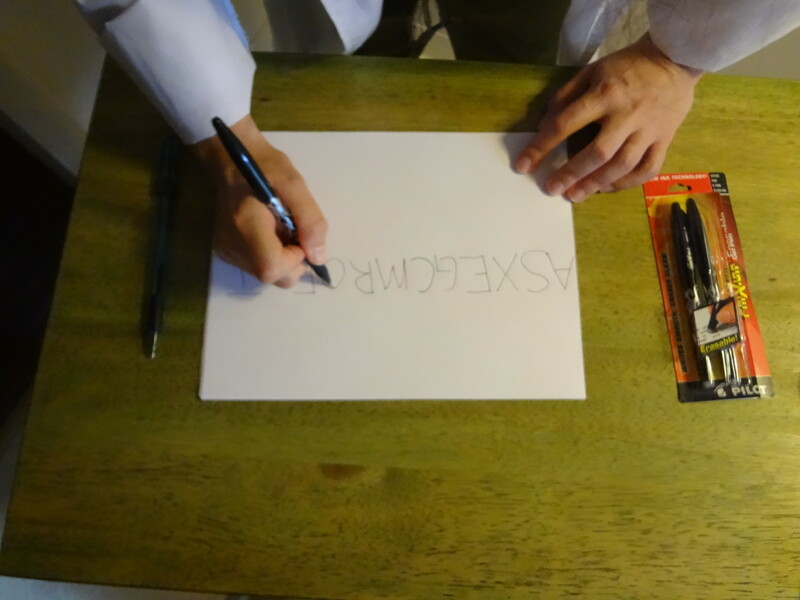 Baking soda mixed with water can be used to make an invisible ink. 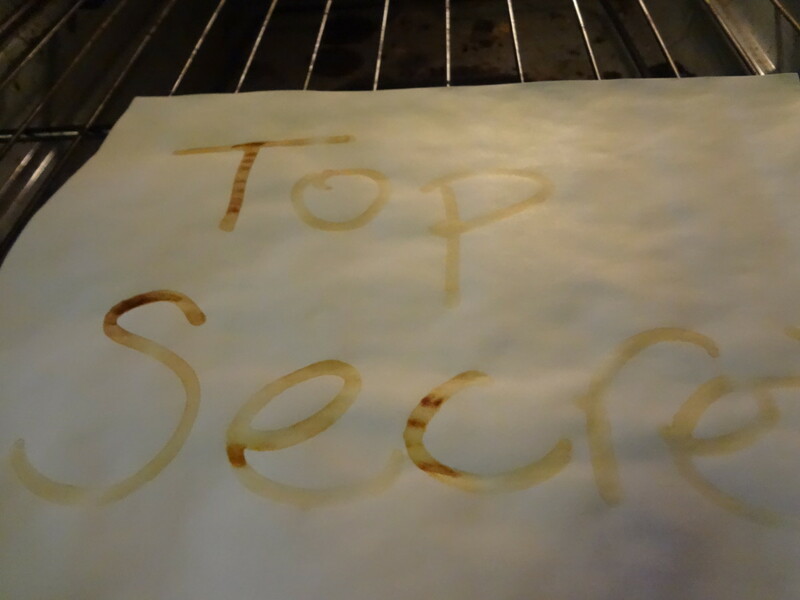 Heating the baking soda will cause the secret message to appear. Baking soda decoded in the oven turns a purplish-brown color. 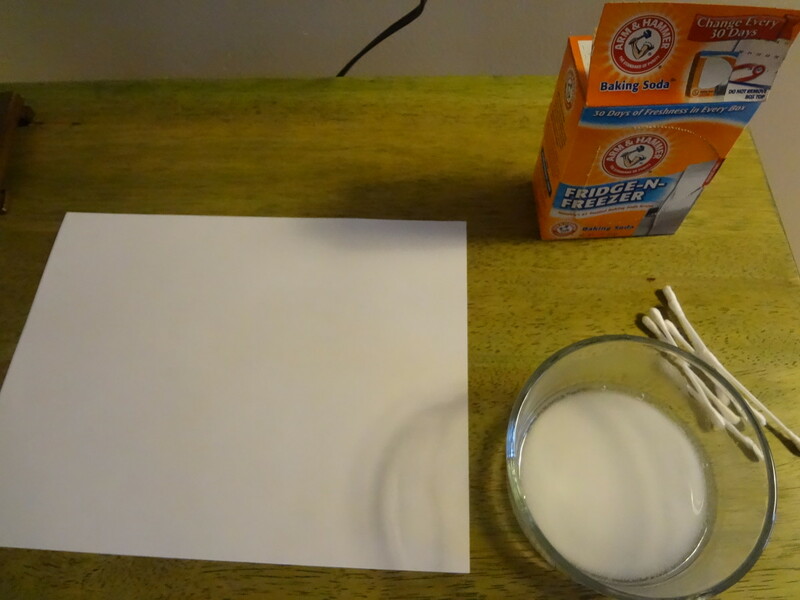 You can make invisible ink with baking soda as well. You'll have to make the baking soda into a paste to be able to write with it. Pour a few spoonfuls of baking soda into a bowl. Add a few spoonfuls of water. Mix it up until it the baking soda is dissolved in the water. Add more water if the mix is too dry. Add a little more baking soda if it is too runny. Dip the q-tip into the baking soda mix and use it to write your secret message. Remember not to apply it too thick or too thin so that it will be legible without causing the paper to wrinkle. Let the paper dry. 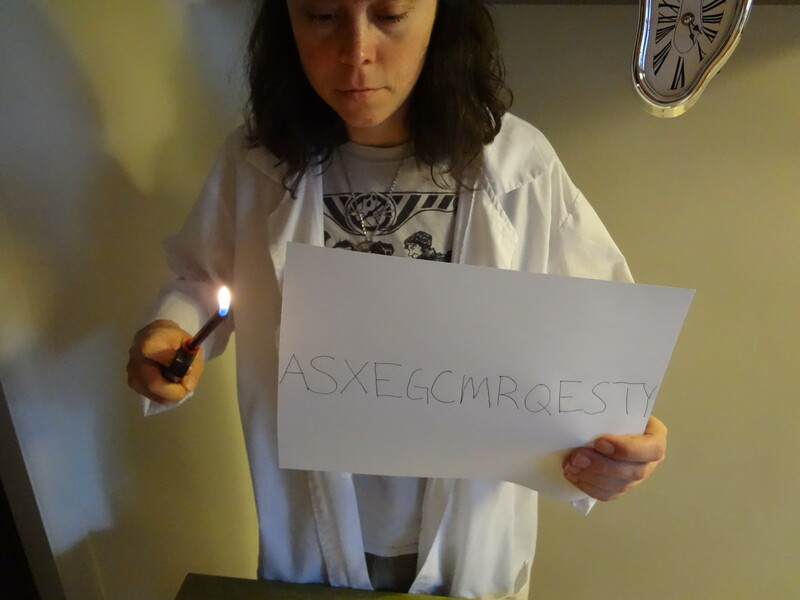 There are actually two ways to ways to decode the message written with baking soda so it can be read. The first way is just like the lemon juice invisible ink above. 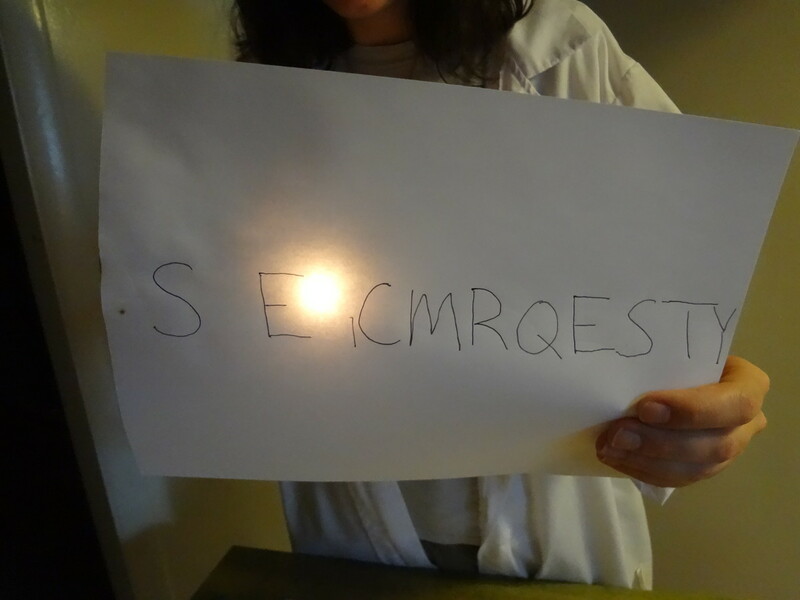 You hold the paper over the candle until the letters turn brown. Make sure you don't hold the paper too close to the flames. Rubbing juice over the paper will cause the message to appear. The second way to read the message is to use juice. Grape juice will work best for this, but other juices will also work. Pour a bit of juice in a cup. Dip a q-tip or a cotton ball into the juice. Rub it over the paper. As you do, the message will begin to appear. This works because the baking soda reacts with the juice. The baking soda will even absorb the color of some juices. So if you use grape juice, the letters will turn a purple color. This is a type of invisible ink that doesn't need heat to be read. First, you will need to make a paste with the cornstarch. You can just mix equal parts cornstarch and water together. 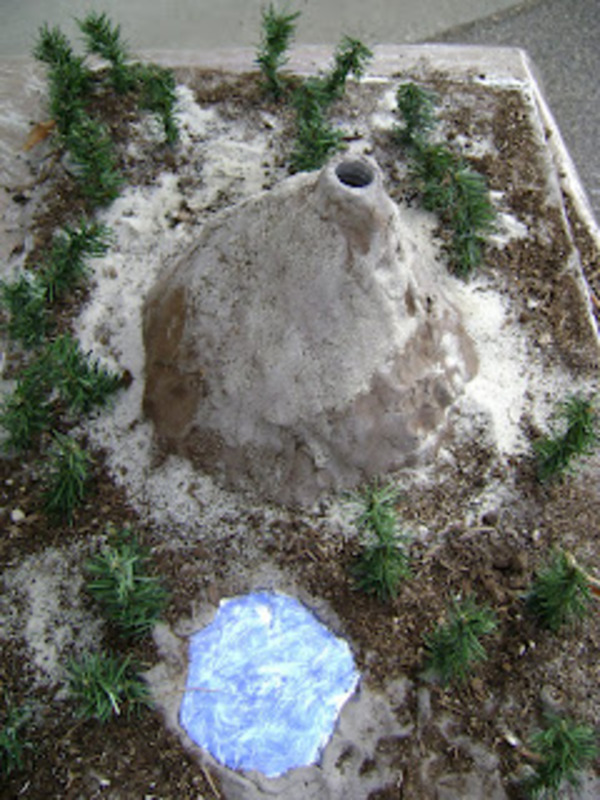 But it will apply more smoothly and be less visible if you heat the cornstarch and water. This is like the method used to make gravy with cornstarch. 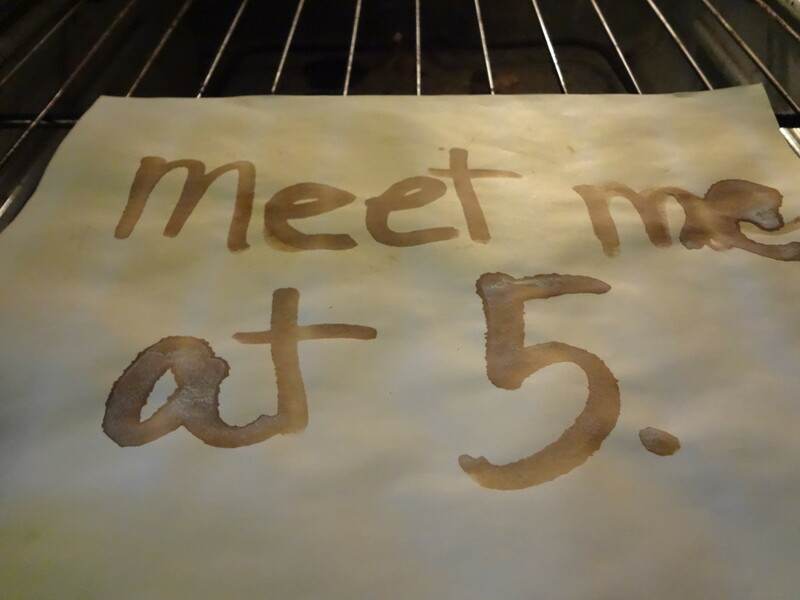 When the cornstarch mix is ready, use a q-tip to write the message on a piece of paper. Allow it to dry. When it is time to reveal the message, you will need an iodine solution. Most pharmacies carry it in the health supplement section. Iodine comes in a bottle usually with a liquid dropper. It should be a about a 85-95% water solution with iodine and possibly potassium iodide. Iodine is commonly used for first aid. There are anti-septics made with decolored iodine that will not work for this. Make sure you get an iodine and water solution. 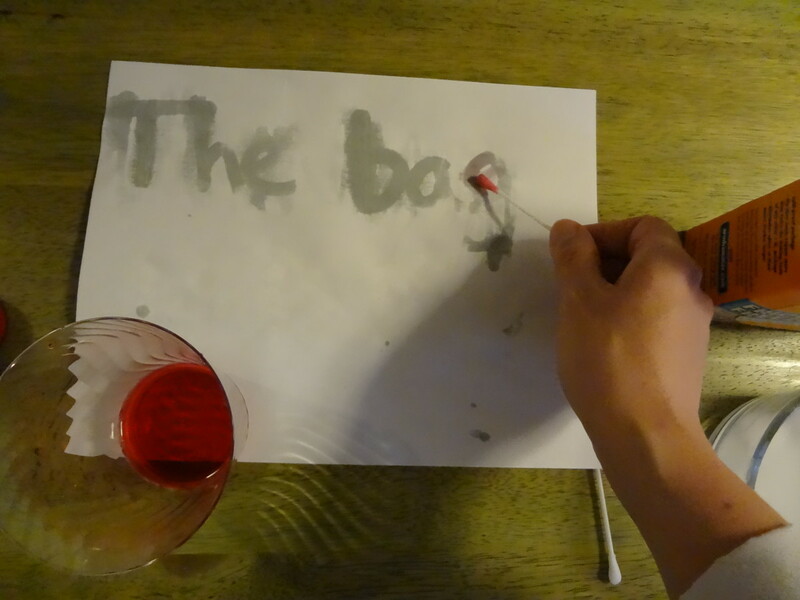 Using a cotton ball, q-tip, or a paintbrush, rub the iodine over the paper to reveal the hidden message. The iodine will turn the message purple. 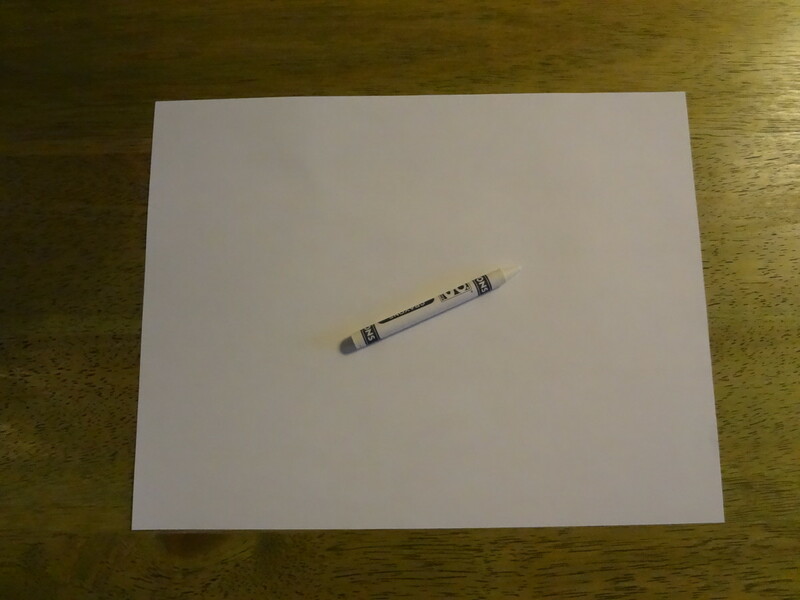 Messages written on white paper in white crayon are invisible. Use a highlighter or marker or paint and color over the paper. The message will be visible. 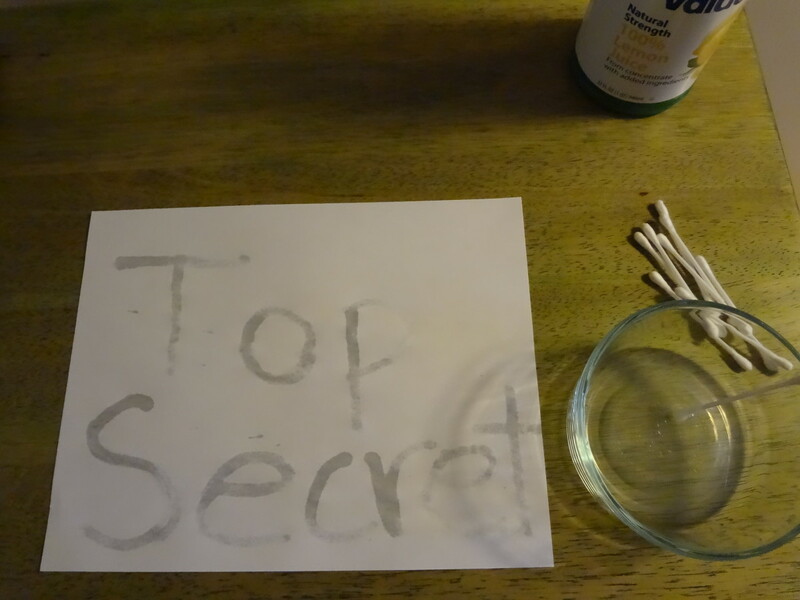 This is the easiest method to make invisible ink and is great for younger children who want to do secret messages. 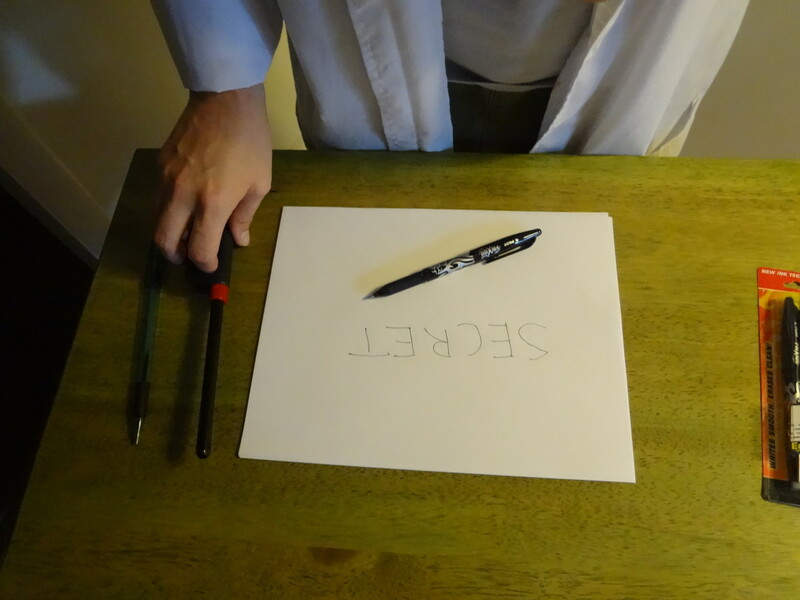 Write your secret message using the white crayon on a piece of white paper. Try to write as heavily as you can. This will make it easier to read later. The crayon writing will be invisible. When you want to reveal the secret message, just paint over the entire paper with watercolors. You can also color over the paper with highlighters or markers if you don't want to go to the trouble of paints. You will be able to read the secret message through the paint. Experiment with different types of markers and highlighters to see which ones make the best message decoders. It works because the crayon leaves wax on the paper. The paint and marker won't stick to it. Use a toothpick to write your message. 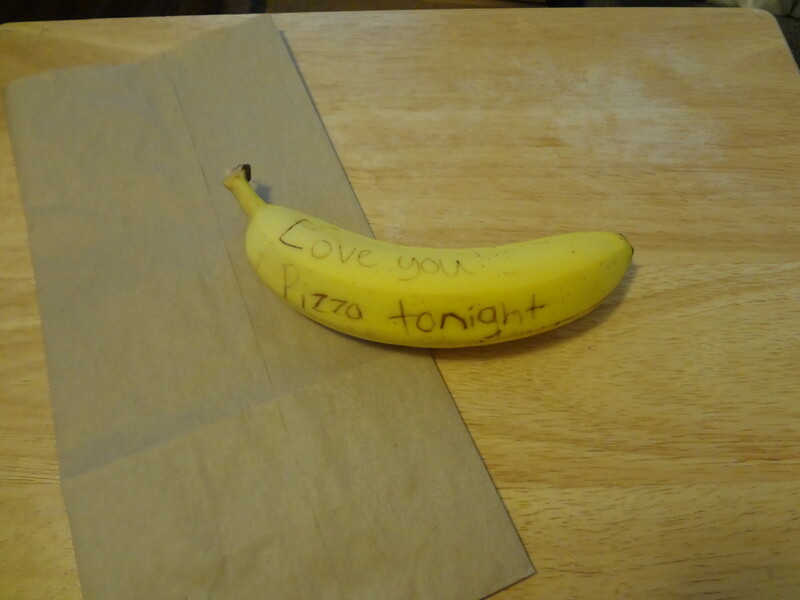 The message is almost invisible when you first write it on the banana. An hour later, the message can be seen. 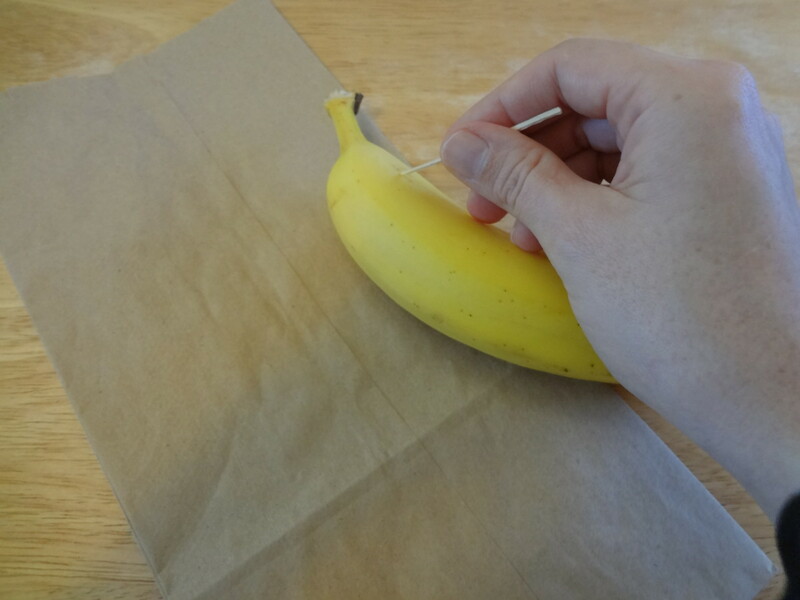 You can write secret messages on a banana peel that will be invisible for about an hour. This is a fun way to send someone a message in their lunch or to pass a message without other people realizing it. Most people wouldn't suspect a banana could be a note. Just write the message on the banana using the toothpick. It will be nearly invisible at first. This is a good time to pass the banana to the person who is receiving the message. After about an hour, the message will darken and will be clearly visible. The letters written with a friction pen disappear. Write your message with a regular pen. 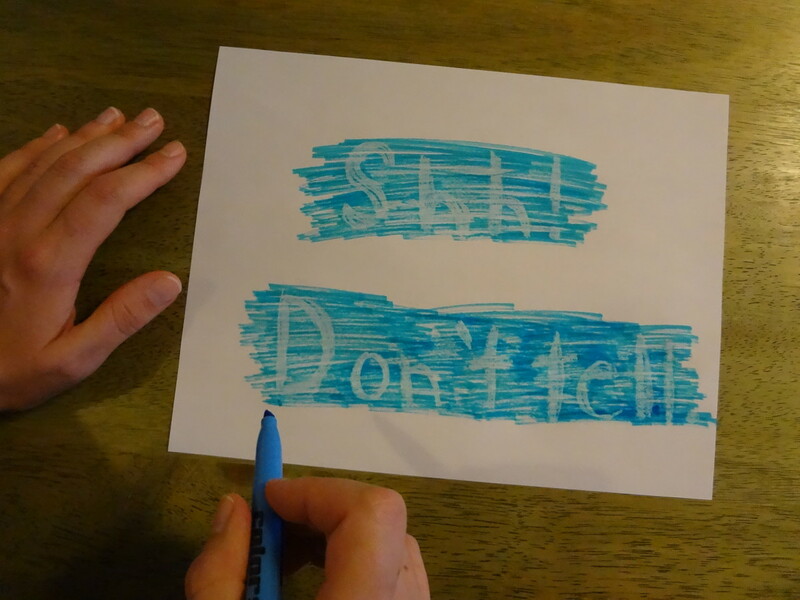 Fill in letters around the message with a friction pen to disguise the secret message. 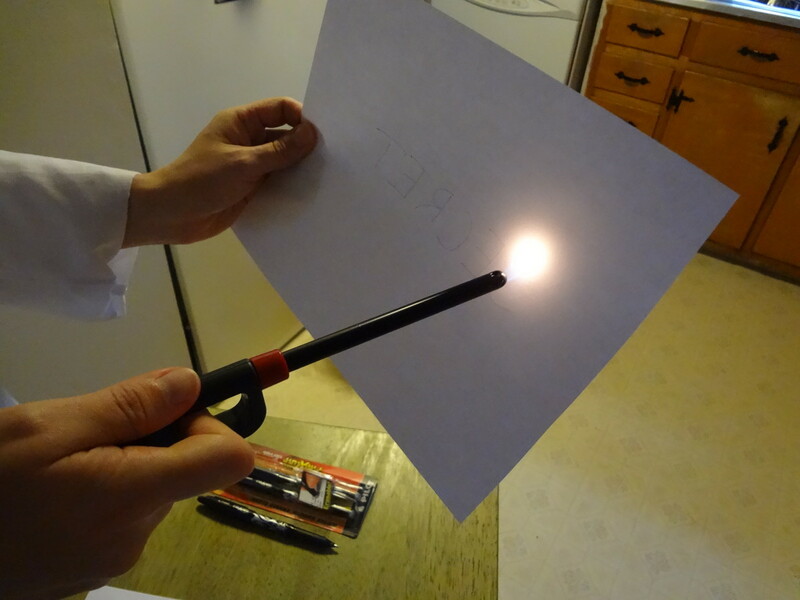 Use a lighter to make the friction pen letters disappear. The letters go away like magic. Just your secret message will be left. Do you want to make disappearing ink? This is a trick many magicians use and it is my favorite way to make secret messages. The letters will disappear right from the page. The secret is friction pens. They are erasable pens that work by friction. The brand FriXion by Pilot is a good pen to use for this. They are available at most office supply stores. There are two ways to make disappearing messages. You can have a jumble of letters that will disappear leaving just your secret message. Or you can write a message that will completely disappear. 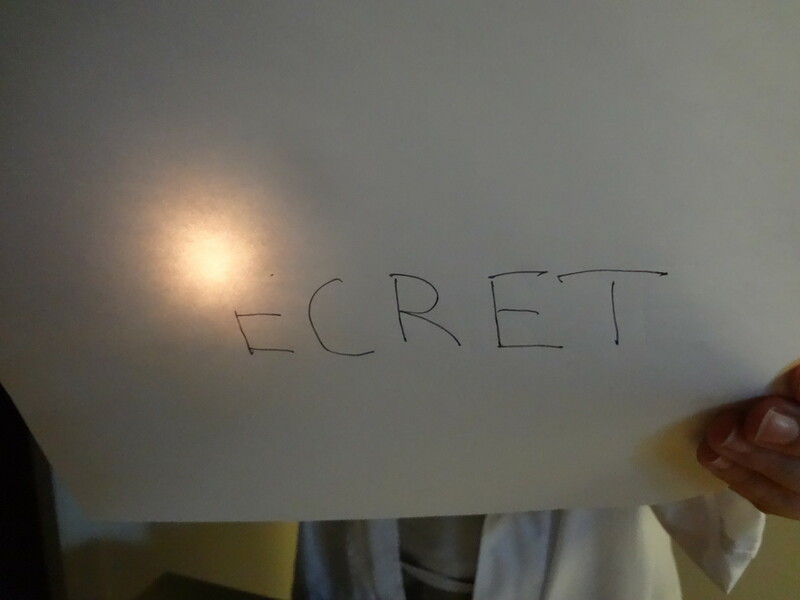 If you want to disguise your secret message, start by writing your secret message on a piece of paper using a regular ink pen. Leave space in-between the letters and around the words to add random letters. Now switch to the friction pen. Write random letters around your message to disguise it. 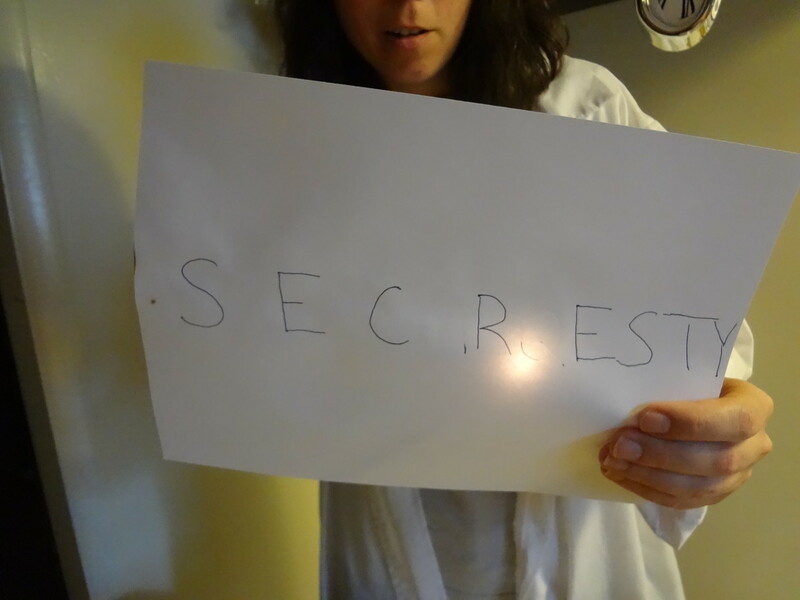 When you are ready to reveal your secret message, hold the paper up to the flame from a lighter or a candle. A long-stemmed lighter is ideal. Be careful not to touch the paper directly to the flame or it will catch the paper on fire. Move the paper back and forth across the flame and watch as the letters written with the friction pen disappear completely. 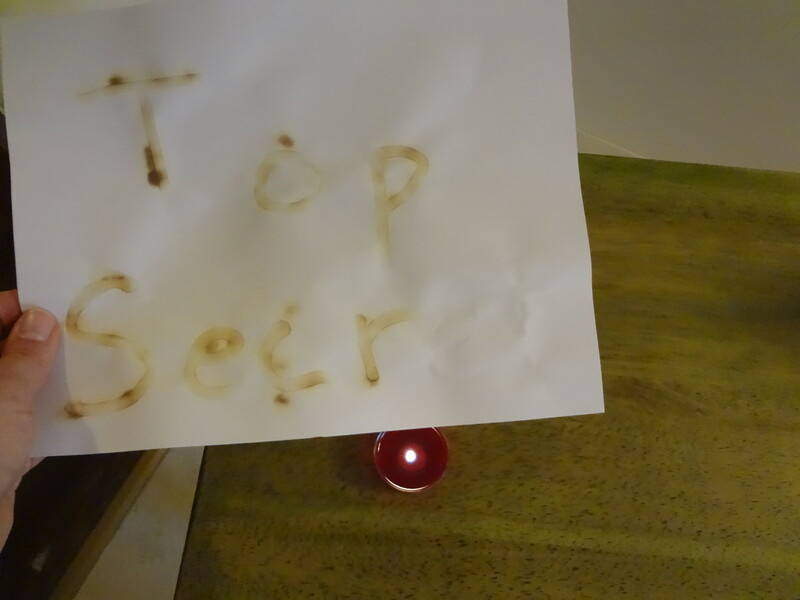 The secret message disappears when the paper is held up to a flame. Write the message you want to disappear with a friction pen. Move a lighter or candle back and forth across the message to make it disappear. If you want to destroy your message after it is read, write the message using the friction pen. Try not to press down very hard as you write or you will leave an indentation on the paper that will be visible later. When the message has been read, hold the paper up to the lighter or candle flame. Move the flame back and forth across the paper to make your message disappear. Now the evidence of your secret message will be erased. This invisible ink shows up under a black light. Another ink that is completely invisible in normal light is blacklight ink. It glows in the dark under a blacklight. A lot of places use this type of ink for stamping hands at the door. It is used at Chuck E. Cheese and in some clubs and bars. Many brides and other people planning parties are using blacklight pens to mark RSVP cards so they know who they came from. You can order blacklight reacting ink or you can buy a blacklight pen. Ordering online is your best chance of finding the specialty pens. Some office supply stores might carry them as well. These will write with ink that glows in the dark under a blacklight but will be invisible otherwise. 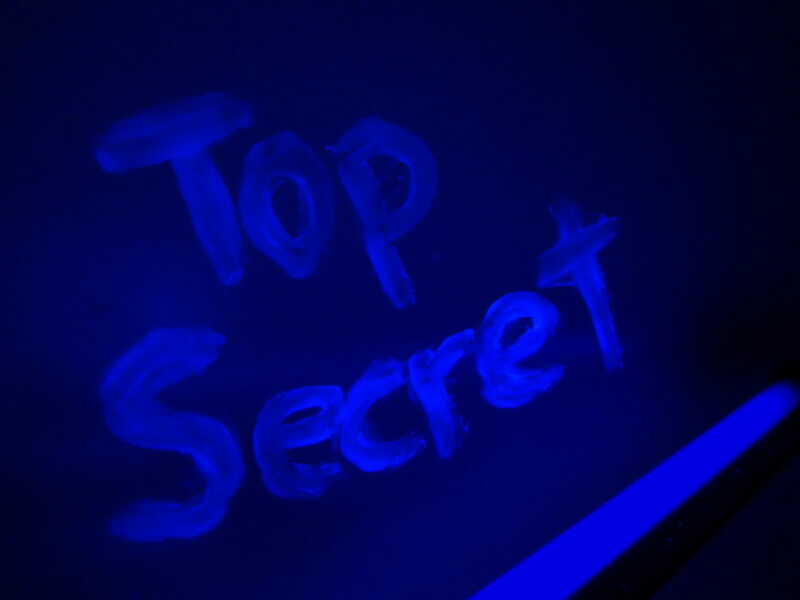 The message written in petroleum jelly glows under a blacklight. The message is nearly invisible on the wall when the blacklight is off. It will glow even brighter with the regular lights off and the blacklight on. Light up the night with these awesome glow in the dark activities and experiments. Make glowing drinks and a glowing geyser. You can even make glow in the dark writing that is invisible in the day. You can make writing that glows in the dark using petroleum jelly. The writing will be hard to see under normal lights. Using your fingers or a q-tip, write a message with the petroleum jelly. 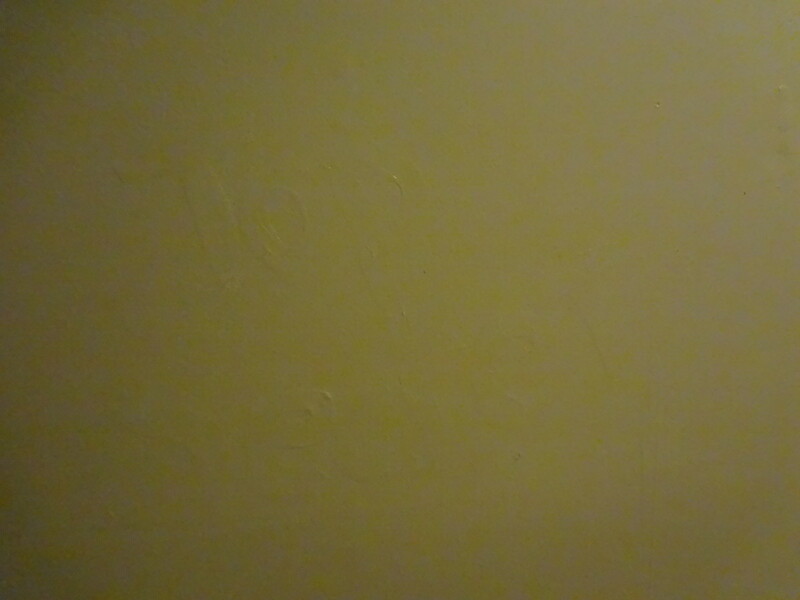 You can write it on white walls if you don't want it to be very obvious. Or you can write it on a piece of paper for easy clean-up. Smooth out any bumps or excess spots in the petroleum jelly as you write. The smoother you make the message, the more invisible it will be in normal light. Then turn out the regular lights and flip on a blacklight. The writing will glow in the dark! Some detergents, B-vitamins, tonic water, honey, and toothpaste with whitener will also glow in the dark. This is a great trick for mystery parties or CSI-type parties. It is also fun for Halloween or just leaving fun secret messages. 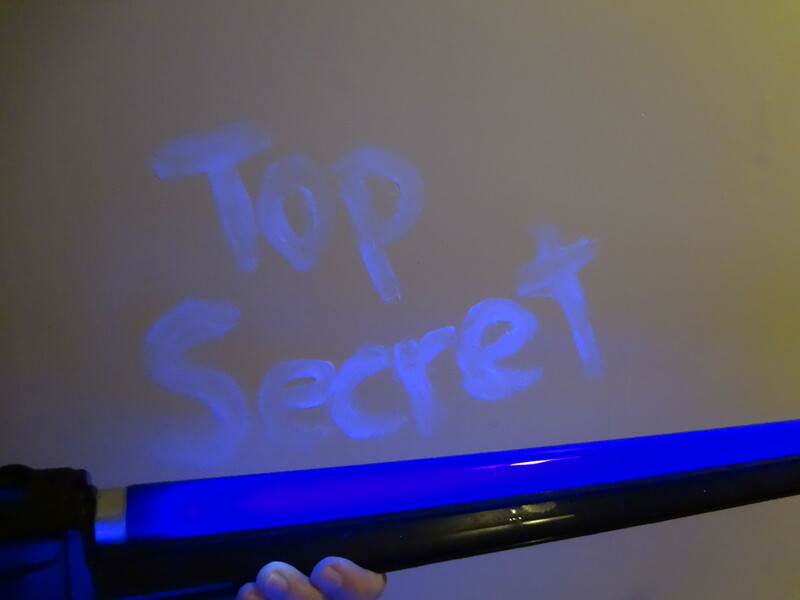 Invisible ink pens with an attached black light to see the messages. What kind of secret message are you going to write? I'm going with the traditional lemon juice ink. I want my messages to disappear with the friction pen. I'm going to leave glow in the dark messages. I'll put my message on a banana. I'm keeping it simple with the white crayon. I am going to turn the message purple with iodine. You can send secret messages by email or text. You can also encode messages or make up your own secret language. 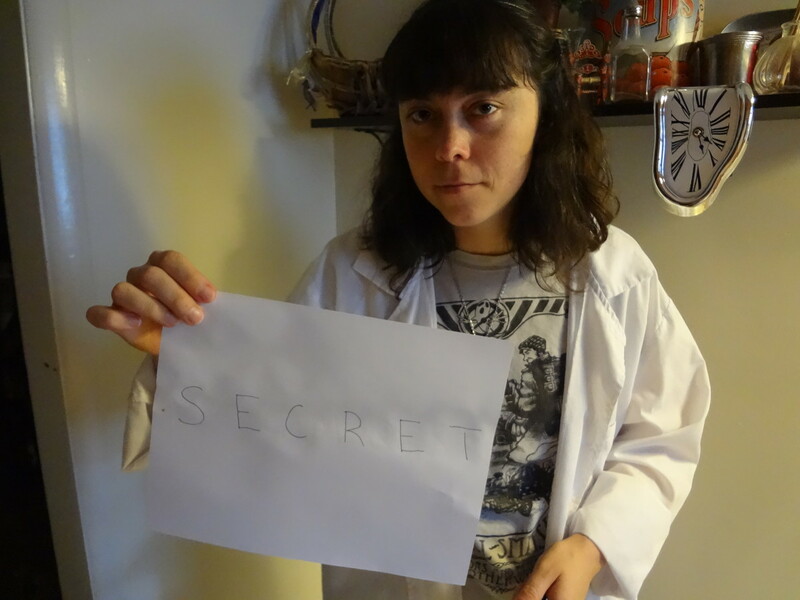 Find out how to write secret messages and how to pass them to your cohorts without getting caught. There are some really neat ideas here. My 8 year old son would LOVE these! what is the scientific reasoning behind these experiments? It is awesome. Must try the baking soda one. I tried and I was successful in first time. very helpful site. really you should get 5 star. I want to know : how to make an ink which when used to write is seen only when the paper with the message written appears when wetted with water? Helen - Each type has a different explanation, but basically it is a reaction with the ink to the substance used to "read" the message. Read the end of each description and it is explained a bit. wow thank you because i can use it! This is cool and fun.. I had tried doing the "Invisible Ink with Lemon Juice". Thank you! Glad you enjoyed it. Hope your kids have fun with this! Very Interesting...going to have some fun with the kiddos. I love these creative little DIY fun things. I'm also going to link this to Pinterest. Keep Hubbing! This is so much fun. We will try all of these on our next rainy day. Super fun ideas. Thanks everyone! Hope you enjoy making secret messages. ignugent17 and rabia - The banana message is really easy and is pretty neat to see. ExpectGreatThings - The baking soda message is a method most people don't know about and best of all, you don't need heat. pstraubie48 - Hope you have fun with your grandson! i love that it will helps me in my science project its just a magic and really the banana was the best of all! Wow! I love your hub. I would share this to my friends. I will try to do the banana . It would be exciting. stephanie - Thanks! Glad you are finding it helpful. nelly - Hope your project worked out well! Elise-Loyacano - The banana one is fun. Thanks! As RTalloni said, "What fun, what fun!" I think my favorite is the banana trick, but then I like to eat, so no surprise there. wow, just what i needed for my science fair! Ross Anziano - Maybe you should try it with your kids that way you don't have to wait so long for a response back from those gangs. Thanks! If I ever go to prison, I will use these methods to send threats to the leaders of enemy gangs. The suspense of waiting to read the message until they can find a backlight will drive them mad...muah muah...Or I guess I could just do it with my kids like everyone else. Time will tell. Thanks everyone for the messages! They are appreciated. Enjoy sharing secrets with invisible ink! My son will love these! Thanks for sharing! Oh my goodness, this hub is amazing. So fun and so full of fantastic information. Excellent work, can't wait to get busy leaving secret messages! Cocopreme, another great hub full fun. I will give the secret message written on a banana a try! Thanks for the fun read. 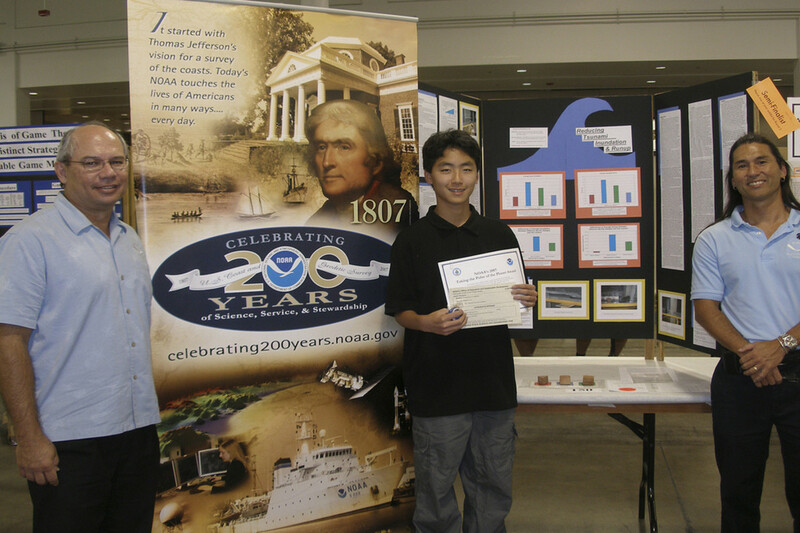 Another great science hub for kids! I love all the ideas you share on this site - they're fun, and they're terrific learning tools. I may try these, too - they're so clever!